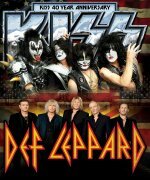 The Def Leppard Summer Tour 2014 with KISS will feature headline sets from both bands of around 75 to 85 minutes according to Vivian Campbell. Vivian responded to more fan questions on facebook about the tour and gave an insight into what they'd be doing after each show... Joe said this week the setlist from Lep would be greatest hits only due to time constraints. Why have DL accepted being the opening act every night? "Well, technically, we're not opening - it's a co-headline tour and both bands will play about 75/85 minutes. Besides, we're old now and this way we can get to bed earlier with a mug of hot coco and watch "The Kardashians!"